Press on Changes in 2015 for a bigger pdf version. Yellow means a change of business or name. 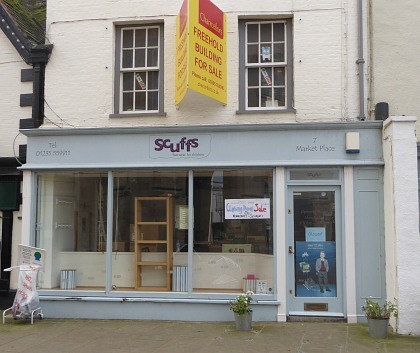 Scruffs (children’s shoes) – opened in 2005, and have had a closing down sale this week. But they could be back if sold as going concern. 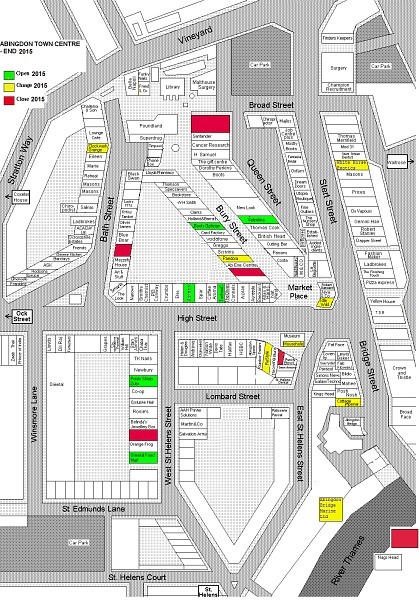 There are black and white pictures of the Old Berks Hunt setting out from the Market Place on Boxing Day in years gone by. 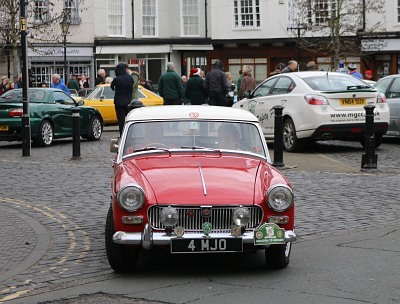 These years there is a gathering of MGs on Abingdon Market Place on Boxing Day. In 2015, MGs started arriving at about 9:30, and the last one came in just after 11:00am. I counted over 40 at one point but there were others that came and went after that. Costa were doing a good trade, and the Sales had started at the clothes shops like M&Co and Fat Face. 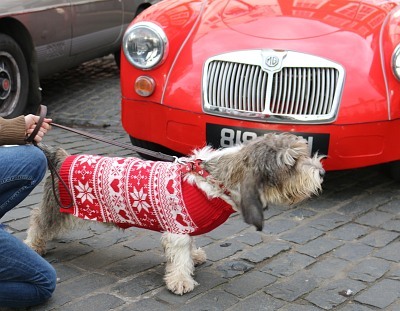 Many people and dogs had come to look at the Mgs. This is Morris a one year old Basset Griffon Vendeen. 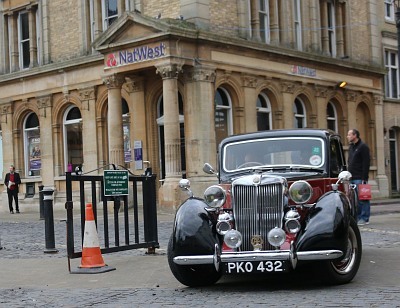 Some of the cars were going on a Boxing Day Drive, ending at The Prince of Wales pub in Shippon, and drivers are seen here being given instructions of the route. 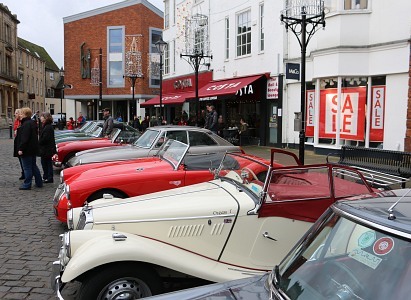 Others came to socialise with other MG owners. Under the willow arches flows the winding Ock. 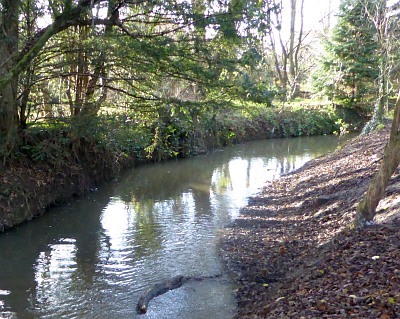 The Mill Stream was the first blog entry I did about Abingdon ten years ago today. 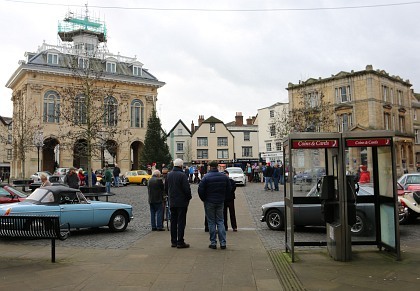 I intended writing a blog about Abingdon in 2006 for one year, and called it Abingdon 2006, but then in 2007 I carried on with The Abingdon Blog. So now it is ten years old. 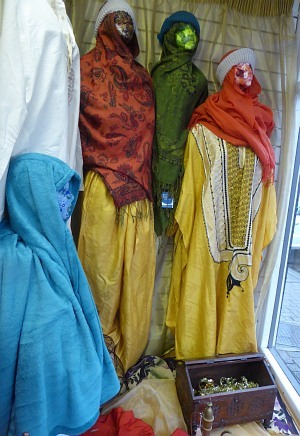 The window of the Sue Ryder shop changes every week. This week they have a nativity scene cleverly made from materials they had on hand. There was a mixture of sunshine and showers on Christmas Eve. 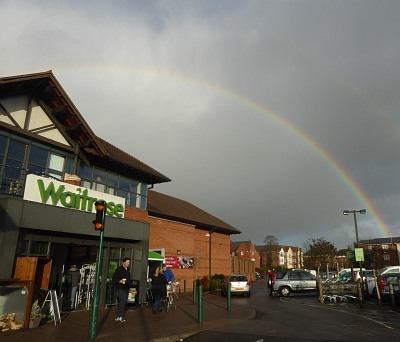 This Rainbow was seen over Waitrose. 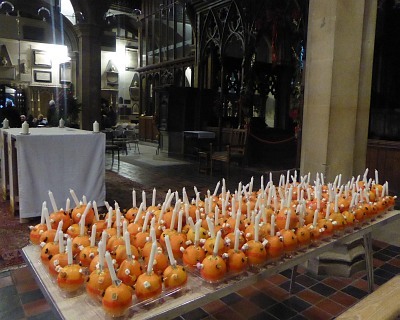 The bells of St Nicolas Church were ringing in the afternoon; and at St Helen’s Church, oranges and candles had been prepared for the very popular Christingle Service. 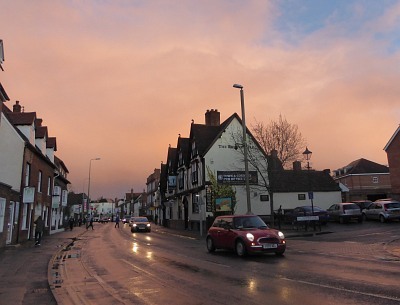 As the sun went down over Ock Street, the sun lit up the clouds with an orange glow. 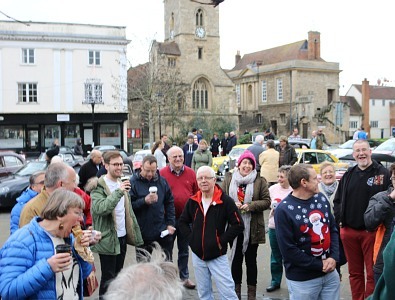 The Abingdon pubs were very busy as people made Merry. Also open late were the churches, and St Nicolas among others had a Midnight service. 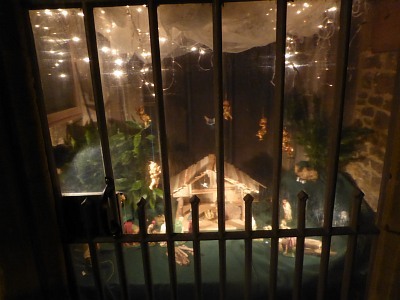 A crib has been there during advent, and was lit up again on Christmas Eve. 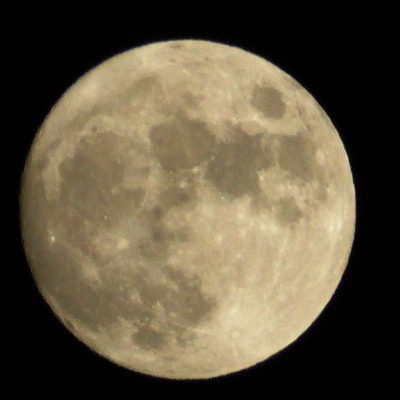 And there was the unusual sight of a Christmas Full Moon for those going home early on Christmas Day morning. 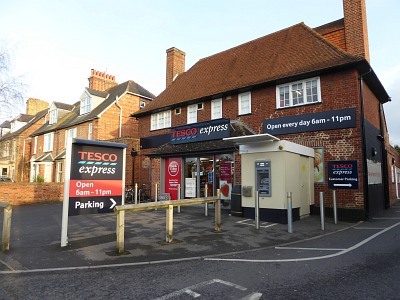 The Ox Pub, on the Oxford Road in Abingdon, became a Tesco Express about four years ago. Since that time another convenience store, called the Best One, has managed to continue trading two doors away. 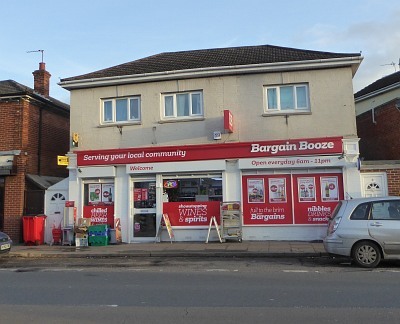 But in the last few days the Best One has changed to a Bargain Booze.